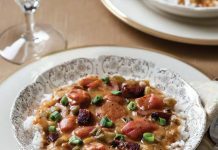 While many are familiar with the lavish réveillon feasts held annually in New Orleans, the holiday tradition has deep French roots. Like many customs, the réveillon began simply and changed over time. Originally, a réveillon was a snack eaten after fasting before communion at Catholic Midnight Mass in French-influenced areas. It was something simple such as tourtière (a meat pie), bread and cheese, or biscuits with coffee. 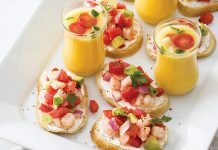 As time went on, snacks grew into meals, and those meals became more elaborate until a réveillon became the grand late-night celebration we know today. As New Orleans grew more sophisticated, its people celebrated with these elegant affairs, particularly on Christmas Eve and New Year’s Eve. Réveillons were meals of many courses and sumptuous foods, which were served at home with family and close friends. There might be oyster stew, whole turkeys, daube glacé, blanquette de veau, foie gras, and imported delicacies that reflected the taste—and the purse—of the family. Offering numerous desserts was also customary, and often including a Bûche de Noël, a Christmastime cake decorated to look like a tree limb. But for the most traditional awakening, you can celebrate by inviting your family or friends over to enjoy a fabulous late-night meal, even if you do it before midnight. 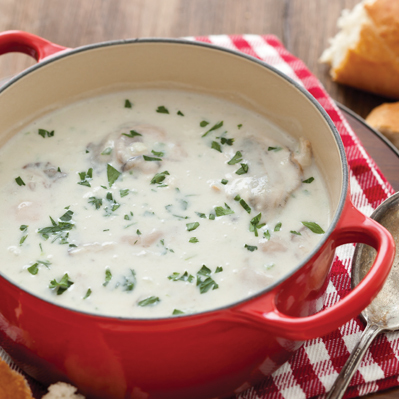 An oyster stew, a turkey, breads, salads, and winter vegetables can make for a sumptuous meal. And just make sure lots of dessert and sparkling wine are available, along with a demitasse of coffee or a café brûlot to cap the evening. In a small Dutch oven, melt butter over medium heat. 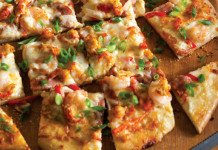 Add green onion, shallot, and celery; cook until softened, stirring occasionally, about 10 minutes. Sprinkle with flour and cook, stirring constantly, 5 minutes. Stir in milk, and bring to a simmer. (Do not let milk boil.) Cook, stirring often, until thickened, about 10 minutes. Stir in oysters and liquor. Cook until oysters are cooked through, 5 to 10 minutes. Add salt and hot sauce to taste. Garnish with parsley, if desired.